Plastic – including bags, bottles, and polystyrene (Styrofoam) – is consistently one of the most found items during the Connecticut River Conservancy’s Source to Sea Cleanup and these items never fully break down. In 2017, Cleanup volunteers collected over 26,000 plastic bottles. 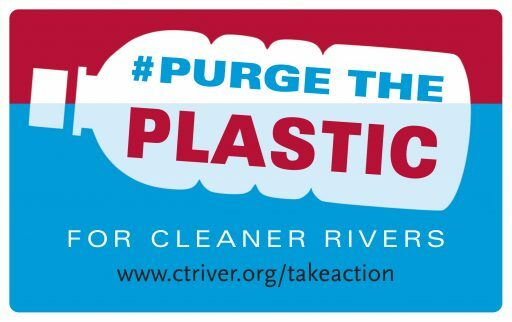 Over 132,000 beverage containers have been removed from in and near our rivers in the 22 years that volunteers have been cleaning up the Connecticut River basin. Sign our petition calling on manufacturers and government to do their part in keeping our rivers clean by stopping trash before it starts. Read on to learn more about plastic trash. How does plastic waste impact water quality and wildlife? When plastic enters the river, it breaks up into tiny pieces, but never fully degrades. As a result, our waterways become polluted with large quantities of what is known as “microplastic.” Over time, these particles make their way to the large floating garbage patches in our oceans. Along the way, wildlife become entangled in it or try to eat it, which can lead to death. A 2012 study found plastic pollutants change the growth and development of juvenile shortnose sturgeon, a federally endangered fish found in parts of the Connecticut River. Endangered freshwater mussels in the watershed are very vulnerable to plastic particles and other water pollutants, and the populations of freshwater mussels have severely declined in the last several decades due to pollution and habitat loss. How much plastic waste is generated & recycled each year? In Massachusettes, it’s estimated that 697,000 tons of plastic waste are generated annually with about 5.4% of plastic waste recycled, as of 2010. In Vermont, there are no estimates for the amount of plastic waste generated. About 35% of all waste is recycled; no specific numbers for plastic. In New Hampshire, there are no estimates for the amount of plastic waste generated. About 30.77% of all containers (including glass and aluminum) were recycled in 2012. No numbers for plastics specifically. In Connecticut, there are no estimates for the amount of plastic waste generated. 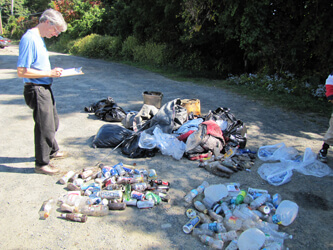 No estimate of the percentage of plastic recycled is available, but the Municipal Solid Waste report for the 2014 fiscal year states that Connecticut recycled 109,994.11 tons of container material (bottles, cartons, etc) during the year. What costs are associated with disposing of plastics? The cost of recycling plastic fluctuates with the market for recycled plastic. It also depends on how much non-plastic material is present in a load of plastic slated for recycling. This is why it’s so important to separate out your recyclables and make sure that they’re all in the correct place—non-recyclable material that ends up at recycling plants increases the costs for plant operators and sometimes results in unsellable material. Currently, the market for recycled materials isn’t doing well, largely due to China’s new import restrictions. Any monetary estimate of a “cost” in this context does not include other, externalized costs that we don’t pay in cash. Instead, we pay with our health and with the quality of our environment. Monetary costs are the tip of the iceberg. A true cost-benefit analysis of plastic recycling must include analysis of those costs that aren’t paid right away, like the cost of water quality restoration, and non-monetary costs, like detrimental health effects, extinction, habitat loss, and other consequences, which can have repercussions for our economy that are more difficult to quantify. In our region, how is recycled plastic used? For the most part, waste plastics produced in the Connecticut River watershed are transported out of the region to be recycled at both domestic and international operations or placed in landfills. One recycling company in Springfield, MA has the capacity to process many different kinds of plastics into shredded or baled products that are then sold to manufacturers. Recycled plastic can be used in clothing, traffic cones, insulation, kitchenware, and many other products we use every day. In our region, which cities and towns have banned plastic bags, plastic straws, or Styrofoam? In Massachusetts, in the Connecticut River basin: Amherst, Athol, Longmeadow, Northampton, & South Hadley have banned single-use plastic bags for retail operations. Amherst, Greenfield and South Hadley have banned single-use, plastic foam take-out containers. Northampton has a proposed ban on single-use plastics. A statewide ban on polystyrene/Styrofoam is currently in the works. In Connecticut: No towns in the Connecticut River watershed have banned plastic bags. No polystyrene legislation currently exists. A state-wide plastic bag ban has been proposed. In Vermont: Brattleboro bans plastic bags. No towns in the Connecticut River watershed ban polystyrene, although the town of Lee (outside the watershed) does. The state legislature is considering a statewide ban on plastic bags. In New Hampshire: No towns have plastic bag bans because town governments cannot create bans without state approval. No polystyrene legislation currently exists. Portsmouth (outside the watershed) has voted to pass a ban but cannot enforce it.